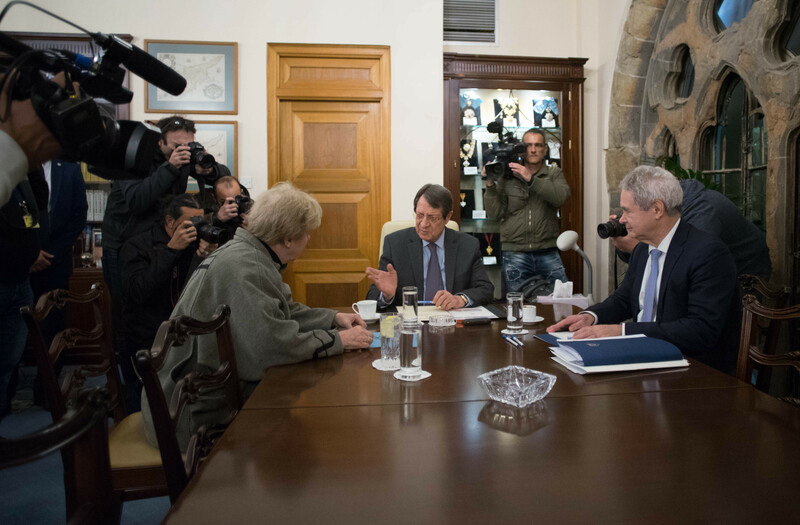 The President of the Republic of Cyprus Nicos Anastasiades received at the Presidential Palace the Special Advisor of the UN Secretary General for the Cyprus Ms Jane Holl Lute. After the meeting, the Government Spokesman, Prodromos Prodromou, told reporters that “the dialogue of the President of the Republic with Ms. Lute continued this evening. Naturally, issues have also been raised regarding the guarantor powers. Mrs Lute will then have contacts with the guarantor powers. The President of the Republic has also reaffirmed to Mrs Lut, as he had done with Mrs Spehar previously, of his willingness to have a meeting with Turkish Cypriot leader Mustafa Akinci. In the days to come, he will contact Mr. Akinci in search of a meeting”. Asked whether the President of the Republic will have direct contact with Mr Akinci, the spokesman said that “the President of the Republic had already expressed his readiness to have a meeting with Mr Akinci. This has also been confirmed through Ms. Lute and will be in contact with Mr Akinci in the following days”. Asked when Ms. Lute will have contacts with the guarantor powers, the Spokesperson said that “this is the responsibility of Mrs Lute. I am not in a position to give you dates. That’s how things will go”. Invited to say if a date has been set for the return of Mrs Lute to Cyprus, Mr Prodromos answered in the negative. Asked whether at meeting the President of the Republic might have with Mr Akinci, Ms. Lute will be present, the Spokesperson said “it is not foreseen, there is no need. We will see in the next few days how a meeting can take place”.